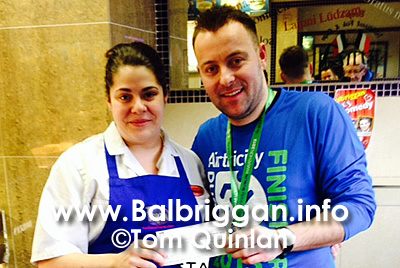 A BIG congratulations to Maria Borza and Brian Vella who completed the Dublin City Marathon on behalf of Balbriggan Cancer Support Group. Maria and Brian raised a massive €1,200.00. Balbriggan Cancer Support Group wish to thank them very sincerely for this great effort and Maira and Brian wish to thank all the people who supported them Well done Maria and Brian!